[By Nick] Last week I was invited to a Yelp event at my local Emack and Bolio's. Yes, apparently Yelp has events. I was mainly there to support my fellow local blogger, Daniel from FUSSYlittleBLOG as he did his first event as a Yelp Ambassador. Yes, apparently Yelp also has ambassadors. I've been meaning to check this place out since I moved to Albany so it all worked out for me. The place is really cozy and welcoming. I felt at home in this shop which says a lot. My guest for the night said she could easily see herself getting ice cream and working on homework here since it's only a few minutes from both of our colleges as well. This is how a scoop shop should be. Now I know I was there for the Yelp event, but I'm not a yelper as I kept calling them. So I skipped the Yelp perks and decided to split a few flavors with my friend for review. Emack's claims their Oreo flavor as the original so there's no way I wasn't going to be ordering that. 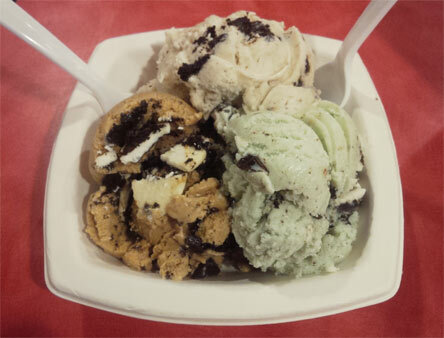 To round out the bowl, we decided to order the other two flavors that involved Oreos, Grasshopper Pie & Mud Pie. 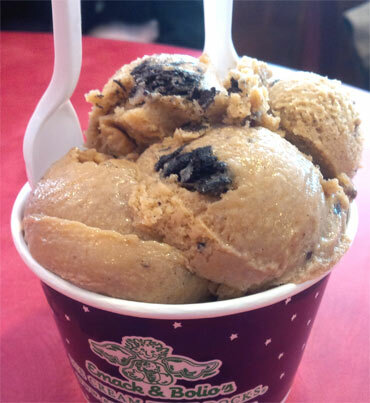 All the scoops look good and there are chunks of Oreos everywhere. Like legit chunks, I can't remember how many times we ran into a full half of an Oreo in our scoops. Going clockwise from the top, the original Oreo is everything you'd expect. I've obviously have had better but it's one of the better offerings. The base has an Oreo filling flavor to it which is always a plus. As I mentioned, the cookie chunks are massive. It's like a 50/50 split of ice cream to Oreos in this flavor. It's as if the ice cream is just a binder to keep the Oreos together which you can never go wrong with. Next up is the Grasshopper Pie. I had high expectations for this but the mint flavor was too weak for me. It was one of the mildest mints I've had. Thankfully this one had the addition of chocolate chips to the Oreos to add a pop of crunch here and there. If you're looking for a minty flavor, this isn't for you. If you want something with a hint of mint to add to your Oreo cravings, go right ahead. Last but certainly not least is their Mud Pie ice cream. This was both of our favorites out of the bunch. The coffee flavor is milky without being too robust. The bitterness comes from the Oreos and chocolate chips used here and work perfectly. My friend was debating getting a hand packed pint of this and bringing it home to enjoy more of later. I would consider the same thing because it's up there with Chocolate Shoppe's version for me. But wait, there's more! You don't think I'd only order 3 flavors do you? After mingling with some of those yelpers, we were ready for round two. Well after looking at all the other things they offer. 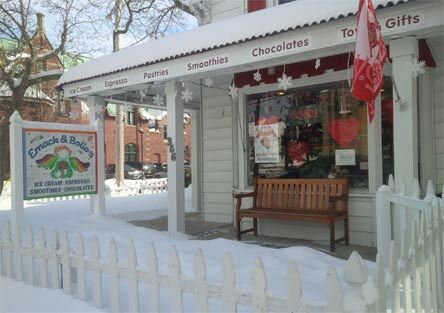 They have a bunch of unique homemade products like Tiramisu Bark and Mocha Peanut Butter Cups. 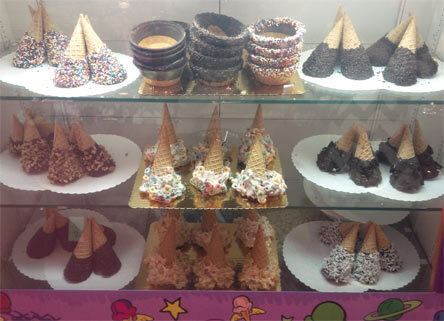 Also, just check out their cones. They all look amazing and I'm not even a fan of ice cream cones. Back to the ice cream. Looking for another theme, we decided to try both of the red velvet offering Emack's had available: Space Cake and Chocolate Red Velvet. While the latter is self explanatory, Space Cake is a bit more creative. Not only does it have red velvet cake chunks, but it also has shortbread cookies inside of a cake batter base! This one was definitely the better of the two. The cake batter base almost had a cream cheese flavor to it making it more like a red velvet flavor to me. The cake chunks weren't dry which is always a downfall of cake mix-ins and the shortbread cookies were tolerable. You all know I'm not a fan of them but they didn't hinder the experience for me and I believe my friend enjoyed their presence more than me. The chocolate red velvet was pretty boring on the other hand. It just tasted like chocolate ice cream with chocolate cake to me. I couldn't tell that they were going for red velvet for all except the color of the cake. 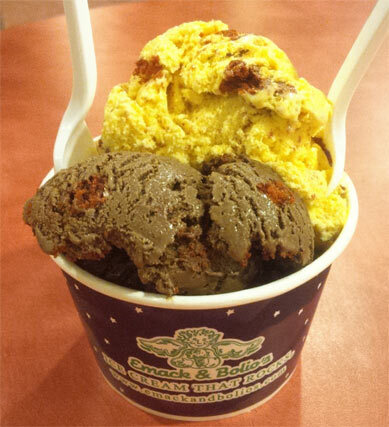 Thankfully we got both flavors in one bowl because when mixed, you have a great red velvet experience. Space Cake adds the cream cheese factor while Chocolate Red Velvet makes up for the lack of cocoa in the other. If you want red velvet while you're there, I'd strongly encourage you get a scoop of each and enjoy a bit of each in each spoonful. So there you have it, my first trip to Emack and Bolio's and certainly not my last. This could end up turning into my go to scoop shop when looking to meet up with people. Not to mention they offer live music on the weekends and open mics on Tuesdays. Edit: You know how I said this wouldn't be my last visit? Well my friend and I ended up going today because she really wanted more. We ended up however trying out their froyo flavor that involved Oreos. This round was the froyo version of Grasshopper Pie and their Coffee Oreo which is Mud Pie without the chocolate chips. Honestly, this wasn't a good idea on our parts. The coffee Oreo flavor wasn't good except for the Oreos. I'm not sure what they did but the coffee flavor was beyond mute and as my friend said "it's tastes like watery ice cream" and I couldn't agree more. However, the Grasshopper Pie's flavor was better here than in their ice cream. It has much more of a mint intensity but suffered that very watered down texture their froyo has. I'd say skip the froyo and stick with the regular ice cream. And for those wondering, my friend did end up getting a pint of Mud Pie to take home with her this time around.